Sure, you could buy some dirt-cheap tabbing ribbon off ebay. If you want some very awesome solder-coated ribbon and you won’t be laminating your panels over 100°C – I have a much better option for you. 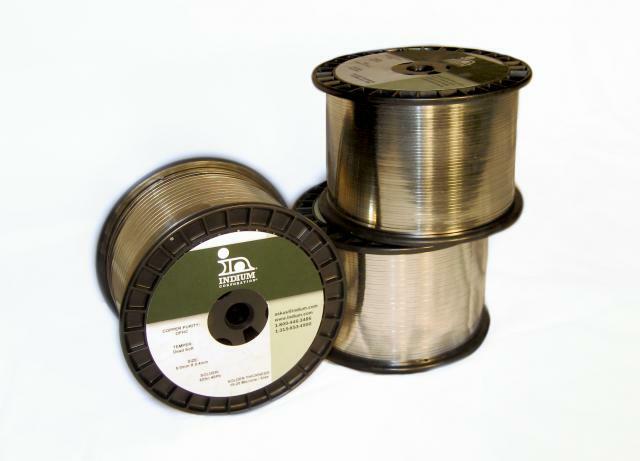 The Indium Corporation makes ultra-low temp tabbing ribbon (melts ~100°C). The advantage? You can use a standard soldering iron and solder solar cells much more quickly because the solder melts more rapidly. Note: I advise using GS-5454 flux – it may be the only flux that promotes wetting onto the cell as quickly as you’ll be soldering! Click here to get a hold of this stuff! The picture above is some of my private stock that I use for testing at work. The picture below is how we package spools – way better than the no-name ball of crinkled ribbon you sometimes get from stock vendors online.